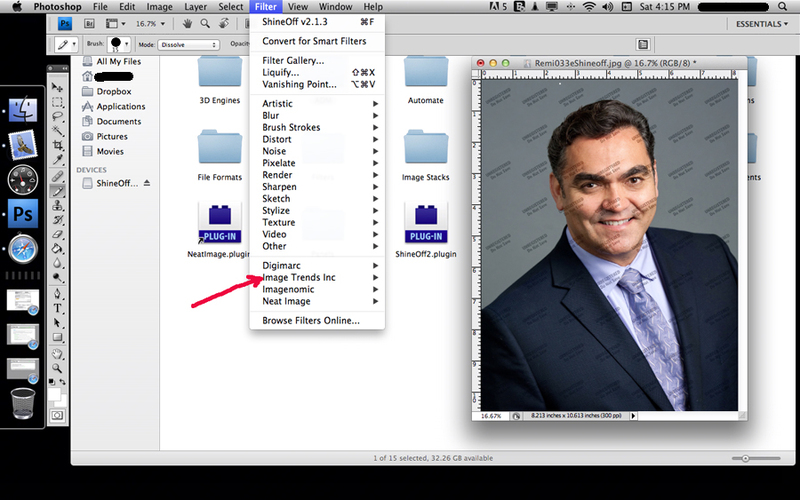 I bought the plug-in Shine-off today to get rid of the shine on a client's headshot. (I used the Neilvn coupon code and got $5 off fyi). All went well. Until I tried to use it. I bought the plug-in. I downloaded it from the big yellow 'Download Now' button on the receipt that popped up following the purchase. I downloaded it. I followed the installation instructions. So far so good. I dragged the right icon into the 'filters' folder in CS 4. Sure enough, there it was under the filters menu in Photoshop. (See attached screen shot). Everything is still going great. I opened my photo, used Shine-Off. Closed Shine-Off. Here is the problem…… the photo is covered in a million little watermarks that say 'unregistered. Do not use'!! So Shine-off is not letting me use the product. Now what? I need to get this photo and another off to the client by Sunday. I filled out a help form for Shine-off but who knows if they'll respond any time soon. Just wondering if anyone knows what I'm doing wrong. It seems to think I'm using a trial version maybe but I downloaded this from the receipt from Shine-off. OK! Problem solved. In case anyone else runs into this you need to activate your new product. I knew that but I assumed the purchase activated it. You need to open your new filter (Shine-off) as though you are going to use it. In that window (the active window you'll see every time you use it) there is a box in the lower left that says activate/buy. (See image). Hit that and put in the serial number you were hopefully given immediately following your purchase. I have to read about this filter more if I can find a tutorial. But even using it on a low setting (low percentage) I don't like what it does to the subject's skin, makes it all plastic-looking. Does anyone know I'd there's a a way to select just an area to which to apply Shine-Off rather than the whole photo? I only see the slider and that's it. Thank you. Does it apply it as a separate layer when in Photoshop, if so it's easy to fix (even though I don't have Shine Off personally). If it comes into Photoshop on a separate layer, make sure that layer is selected, then holding down the Alt Key (PC or Option Key Mac) click on the Add Vector Mask Icon at bottom of Layers Palette, (3rd from left - see image) and it will then place a black mask hiding the effect all over, now merely with a soft white brush paint over the parts on the image where you want it to appear, also that's a good way to reduce the effect because if it's too strong, merely lower the opacity on that layer itself. Brush with 100% though, easier to just lower layer opacity. Now, if Shine Off does *not* create a separate layer, merely duplicate your current layer so you have a copy, Shine Off will do its thing so you then do as above, place a mask and brush. I should also point out, if you have say a few people and some need more/less 'Shine Off' I would then change brush opacity to say 20% and build up over different sections until you get the desired result on each subject. Thanks Trev! I'll see if it applies as a new layer. That's a good suggestion if so. If not I can try the duplicate layer work-around. I guess I could do that and then erase everything else. No, it does not seem to come in as a separate layer. I determined this by applying Shine-Off and then going to 'layers' and seeing if there was a new layer and no there wasn't, just the background layer. But I'll try your duplicate layer idea and either try a mask, which I'm not fluent in, or erasing the new layer where I do not want S-O applied. Thank you again Trev. No, don't 'erase' anything, that's too much work, just do as I instructed above, duplicate that background layer you are working on, then apply the Shine Off which will work on that duplicated layer, and just hold ALT (or Option on Mac) key down, click that add layer mask icon and the *whole* layer on which the Shine Off was applied to will now be hidden behind the black mask (you see on the Layer, not on the image I should point out if you are not familiar with masks). Then, on the actual image itself on a face, using the brush, making sure White is the selected colour in the Colour Swatch (hit D on keyboard to reset the swatches to White Foreground/Black Background default colours) and then brush over the face/s. It's easy. Because if you make a mistake, just click X on keyboard to swap the swatches around, the Black will now be the Foreground colour, and paint back on the image again and it will then 'hide' it, then hit X again to bring White back to re-do it. Once you get the hang of 'toggling' the swatches, you are laughing. 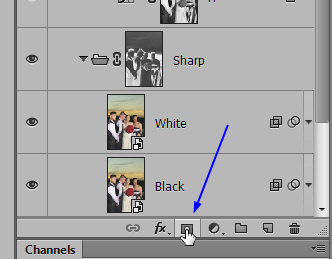 This is what I am talking about, image below: (if you see where my cursor is point to that tiny little icon, click and it defaults to the same as this image, (hit D on keyboard) and to switch (toggle back/forth), you can just hit X or, click that tiny double ended curved arrow you see beside my cursor. Thanks Trev, I will give that a try. I haven't had much luck so far 'getting' masks. I can't seem to grasp what's going on as well as how to actually do a mask. But I'll see if I can do this as it sounds fairly simple. Skip I owe you an apology, I mistakenly said hold Ctrl key down, in my last post, but in the top one I did say Alt initially, so it's the ALT key or Option key on Mac.... I was not paying attention, no wonder you cannot get a 'black' mask, so sorry, I have edited the post above. Thanks Trev. No problem! I hadn't tried this yet but now I'll have it right. Thx for the correction. I'll let you know how I make out.